After thirteen years of experience working with a number of organizations and several top sponsorship sales executives, I’ve narrowed it down to a pretty simple matrix that articulates what the top 20% do differently. The best sponsorship development executives focus on creating relevant stories that resonate with brands. Sure, it’s easy to sell the obvious…warm, cozy, low-risk assets that are simple to quantify and defend when the sponsorship is challenged, but that’s not going to allow you to standout in a highly competitive marketplace. I would classify these as ”needs”… and you don’t need a strategic development person to sell those, do you? Intellectual property rights, exclusivity, association, and BIG ideas are a different story -they aren’t tangible and harder to quantify, yet – they are the most valuable component to any successful sponsorship. This is how brands create a clear point of differentiation and connect with consumer on an emotional level. These powerful assets would be classified as “wants” – and without a smart, savvy and articulate executive, you’ll never realize the full potential of what your property is truly worth – you’ll constantly be underselling and slowly liquidating your inventory, but what happens when you run out of stock and need to increase revenue? The best executives that I know or have worked with over the years are marketers first and fans second – they craft compelling stories that resonate with brands and win with consumers. 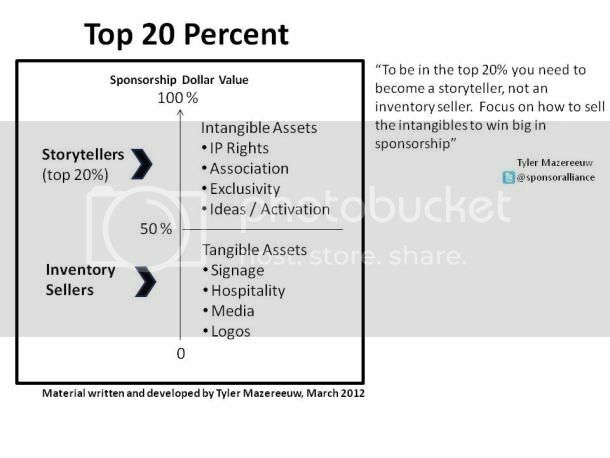 This matrix puts things in a simple visual that can be used as a friendly reminder to all of us that selling inventory at a reduced rate / value-based option, is easy, but the fully integrated exclusive partnerships that tell a compelling story will ensure brands realize the full potential of a partnership and reinforce the power of investing in sponsorship marketing. In exchange, you’ll quickly realize that it’s not that complicated and you’ll be on your way to the Top 20%.